Each year in the Las Vegas/Clark County, NV area, thousands of entrepreneurs decide to walk the path, venture out and start their own company. Ever wonder what drives these men and women to work long hours, hardly taking any pay and risking everything? It’s that unbelievable feeling one gets from starting their own company, seeing its success and the knowledge that it was your vision and determination that made it happen. There is quite an array different business start-ups that these entrepreneurs that range from Consulting, E-Commerce, Senior Care Services, New Product Development, App Development, Construction, Restaurateur, Retail Store, Property Management/Investment, Medical Devices Distributor, Tech Start-Up, Media Services are among the many different directions an entrepreneur can take, including signing up with one of the 1000’s of franchise businesses that are available to you these days. Considering that the web is nearly in every place, your business venture is not just limited to your local area, now the entire world can be your market, and with the cost to launch a new business venture very low, any type of business can be started these days. In addition, with more businesses creating software for mobile devices, there is no limit to business opportunities that are available to entrepreneurs. When consultants work from a home office, often they are under the assumption that their homeowner’s insurance policy will provide coverage in the case their Las Vegas/Clark County, NV home-based business suffers a loss. Unfortunately, that is not the case. Most times a typical homeowner’s policy may cover as little as $2,500 for in-home inventory and equipment (example: computers) and $250 for incidents that occur outside the home. As business owners, we know it’s very common to have more than $2,500 invested in your company. Many times these consultants do not see the value of liability insurance, if they were to be fired due non-performance and then sued for what is usually always a hefty sum, would your company have the funds available to them to either hired a lawyer to defend itself or pay the amount in case you are found at fault? If the only policy you have is your homeowners policy, you have no coverage. What if a client comes to your office and slips and falls on your property? Again, there is no coverage. Worst yet, what coverage do you have if you suffer a home fire or other disaster and the insurance agent discovers you ran a home-based business but didn’t include that on your policy? Very possible, the coverage for this fire could be voided, for both the home and business. As you can see, these are worst-case scenarios, but that is what property insurance coverage is for, because as you are well aware of, if something can go wrong, it will. The experienced brokers at PJO Insurance Brokerage can present your company with insurance coverage so your company will be protected. For professional consultants who provide services, the most likely policy is a Professional Liability Policy. This type of insurance coverage protects you and your company against claims by clients related to the performance of your work. These coverages can include: alleged errors or omissions and negligent acts resulting from you or your company’s performance and protection from loss of client data, negligence or non-performance claims. Also, please note that Professional Liability Insurance policies may also cover attorney fees and judgment awards; personal liability (libel and slander); intellectual property; and covers employees and independent contractors. Electronic commerce, also commonly known as e-commerce, ecommerce or e-comm, refers to the buying and selling of products or services over electronic systems such as the Internet and other computer networks. However, the term may refer to more than just buying and selling of products online. It may include the entire online process marketing, selling, servicing developing, delivering and paying for products and services. With the incredible widespread use of the Internet, the amount of business done electronically has grown over ten fold. The use of commerce is conducted in this way, drawing and spurring in electronic funds transfer, Internet marketing, electronic data interchange (EDI), supply chain management, automated data collection systems and inventory management systems. As a company’s e-commerce starts to flourish, there can be new risks that may appear and owners could constantly review their insurance program. There is big difference in online businesses and their brick-and-mortar counterparts, which present what challenging situations concerning insurance coverage. An example would be a small e-commerce company that operates in this matter: The company that owns the site conducts business from their office in the Las Vegas/Clark County, NV area, the “store” or server as it is called is based in San Francisco and a third-party fulfillment company that stores their products is based in Salt Lake City, UT. Data security, in which the most commonly publicized areas of exposure involve unauthorized access to customer data and/or the dissemination of customer data by accident or through fraud. For online merchants, it becomes an added obligation to protect that data. If that information is exposed or compromised, there could serious potential cyber liabilities. What could happen when a business interruption is caused by one of your third-party providers? Certain times, business could be interrupted when customers are unable to access the website because of denial of service or a disruption of some sort. Any server problems that may occur during a holiday-buying season could have a serious financial strain on your company’s bottom line. Also business interruption can happen because of a disaster like a fire at secondary support location – your warehouse or your main supplier. We at PJO Insurance Brokerage believe it would be a wise move to have one of experienced professional brokers sit down with and design an insurance program that will fit your particular company’s needs. Companies such as Information Technology and Software Developers have Professional Liability (Errors and Omissions Liability) technology insurance coverage needs. The majority of information technology companies such as software designers, web site designers, internet designers, computer consultants, and computer programmers sell technology services and products are used by their clients in the running of their companies. Technology insurance, such as computer consultant insurance or software developer insurance, is needed when a failure of hardware or software products or services provided to clients can result not only in critical mistakes being made, which can result in lost income and litigation, but also in business failure. Professional Liability Insurance, which also is known as computer consultant insurance hardware and software products, as well as services that control key company functions like database management, intranets, office automation, word processing, accounting and billing, e-commerce, and websites. Information technology companies can have exposure to a lawsuit for an intellectual property violation as well. Technology Liability Insurance, such as computer consultant insurance or software developer insurance can provide protection special personal injury issues involving privacy issues and computer virus attacks. Legal defense and settlement coverage for an allegation of financial loss related to professional services is specifically provided by Software Developer Errors and Omissions Liability Insurance. Should a business allege that the software they contracted with a company to develop contains a glitch and locks up their system causing lost revenue, having a Las Vegas/Clark County, NV Errors and Omissions Insurance Policy may be most beneficial in keeping your company afloat and running smoothly. No matter what particular new venture you may be starting or being involved with, having the proper insurance program in place beforehand would be one of the smartest business decisions your company can make. 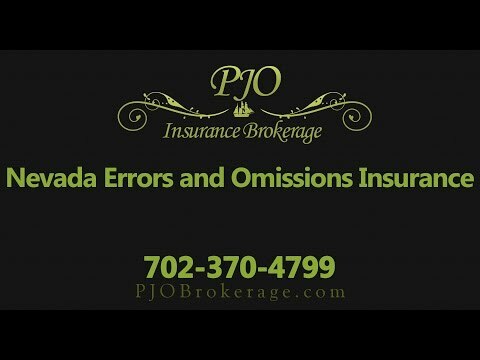 The experienced and professional brokers at PJO Insurance Brokerage look forward to working with your Las Vegas/Clark County, NV business.